Home Viral Feed Here’s How Deepika Padukone Chose To Compliment Anushka Sharma’s Latest Fashion Statements. 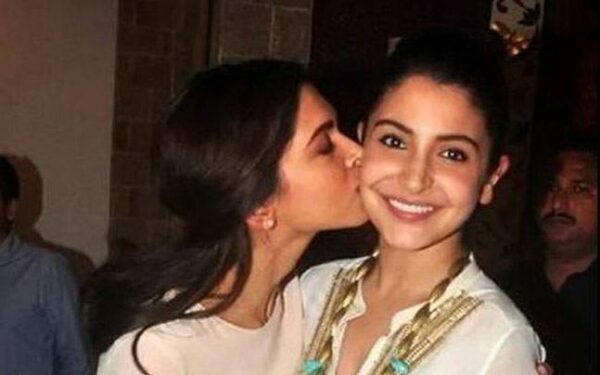 Here’s How Deepika Padukone Chose To Compliment Anushka Sharma’s Latest Fashion Statements. Regarding Bollywood, from decades we have sustained through myths like two actresses can never be friends. Especially if they are big banner’s leading ladies. They have their own cat fights to deal with and own high stature to maintain. But, gradually with emerging new patterns and trends, this myth was shattered on various occasions. Irrespective of on screen rivalry or personal differences, Bollywood ladies are all for warm relations now. They can be seen sharing extraordinary on screen and off screen chemistry by supporting and encouraging each other’s works and fashion choices. Now, recently Bollywood actress Anushka Sharma posted some dazzling picture of herself on her official Instagram account. Their she was seen in two different stylish avatars, sporting classy and sophisticated best of herself. She was wearing a black flared dress and a golden checked suit. Now,with these pictures fans and followers are going gaga over her, amidst which Anushka got a new fan for herself. Her back to back style statements were complimented by none other than Deepika Padukone herself. She showered her with love and praises. In the work front, Deepika is busy with her next project Chappaak by Meghna Gulzar, whereas Anushka was last seen in Zero, and is yet to announce her next venture. The post Here’s How Deepika Padukone Chose To Compliment Anushka Sharma’s Latest Fashion Statements. appeared first on RVCJ Media. Previous articlePriyanka Chopra Jonas And Nick Jonas Are Getting Divorced? Here’s Everything You Need To Know.